So what’s a clean and green January without a green smoothie? Enter my current obsession: Mango Avocado Oatmeal Smoothie. For all the clean eating I do, I’ve never been much of a smoothie person. At least not for breakfast. Snack, yes! But not breakfast. Don’t get me wrong. The first thing I think about when I get out of bed in the morning (and sometimes before I go to sleep at night) is what I’m going to eat for breakfast. But for me, breakfast has to be hearty and filling, and smoothies have just never filled me up. But, if you’ve been following along this month, I’ve challenged myself to add green fruits and/or veggies to every meal. So I’ve been spending quite a bit of time creating and testing new ‘green’ recipes (like last week’s Winter Sunshine Salad.) And since smoothies are a great way to incorporate fruits and veggies into meals, plus a whole bunch of other nutritious ingredients, I knew I had to throw a smoothie recipe into the January mix! 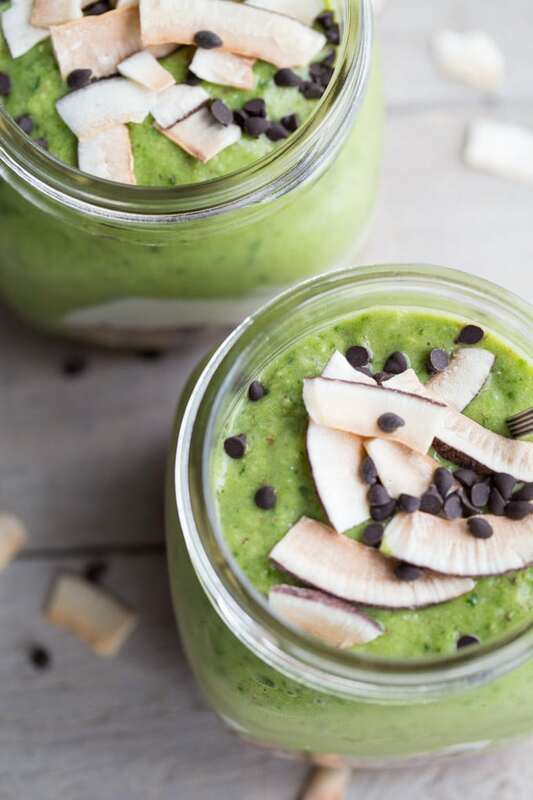 This Mango Avocado Oatmeal Smoothie isn’t your average green smoothie. First, it requires a spoon. There is no drinking this one with a straw! So let me break down this Mango Avocado Oatmeal Smoothie for you….. The layers of oats, yogurt and smoothie pack in a whole lot of clean eating goodness. We’re talking healthy fats from the avocado and flax, fibre from the chia and oatmeal, and a dose of protein from the Skyr yogurt! Plus, the entire combo tastes like a little breakfast treat! The oats are sweetened with chocolate almond milk, the smoothie is sweetened with mango and banana, and there’s a little sprinkling of coconut chips and dark chocolate chips on top. 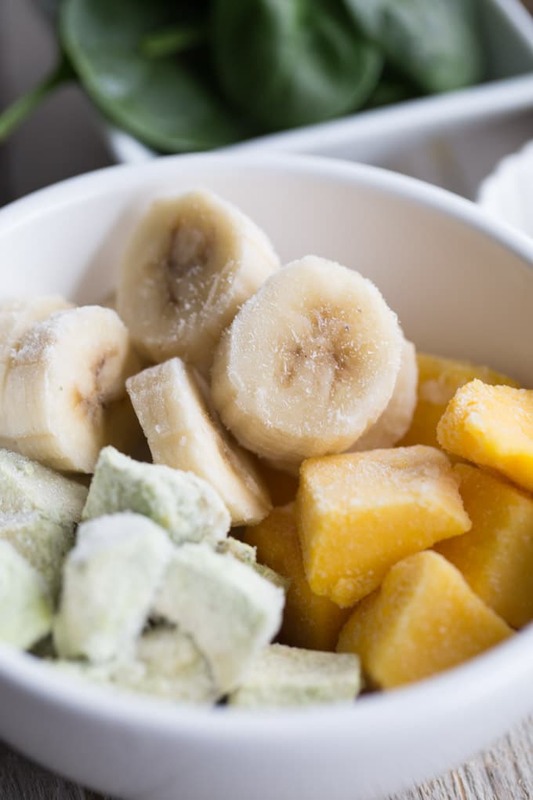 There’s a lot going on in this smoothie, but I promise it’s not a lot of work, and it’s a great way to get your green fruits and veggies in for breakfast! This Mango Avocado Oatmeal Smoothie has a whole lot of clean eating goodness going on! It has layers of oats and chia, Skyr yogurt and a green smoothie made with mango, avocado, banana, spinach, flax and almond milk. All the healthy fats, fibre and protein make this a filling breakfast! In a small bowl, add the rolled oats, chia seeds and chocolate almond milk. Stir until combined. Spoon out the mixture into 2 wide mouth mason jars or dishes. Cover and refrigerate for 1 hour, or overnight. Once the oats and chia have absorbed the milk, layer on the yogurt. In a blender, add the spinach, almond milk, avocado, mango, banana and flax. Blend on high until smooth. Pour over yogurt mixture. (The smoothie will be thick). Top with chocolate chips and coconut, or any other topping you like. For this recipe, I used plain Skyr yogurt, but you can also use plain Greek. I like these options as they are thick and creamy. If you’re not a fan of plain yogurt, you can always stir in a drizzle of honey. I use President’s Choice frozen avocado chunks. They are perfect for smoothies! You can use any type of milk you like in this recipe. I just prefer almond milk. 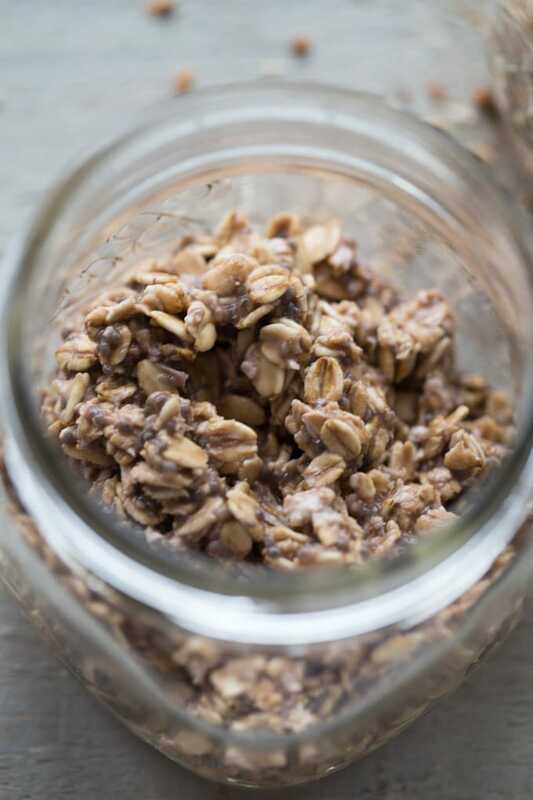 I used chocolate almond milk in the oats to add a little sweet taste, but you can always use unsweetened if you prefer. This recipe makes enough for 2 average-sized smoothies, or one very large smoothie bowl. So perfect for sharing! If you only want one smoothie, you can just half the recipe. I am in for this recipe Leanne, I am always in search of a healthy recipe. Thanks Puja! I’m so glad you like this recipe! I hope you get a chance to try it. Happy Wednesday! 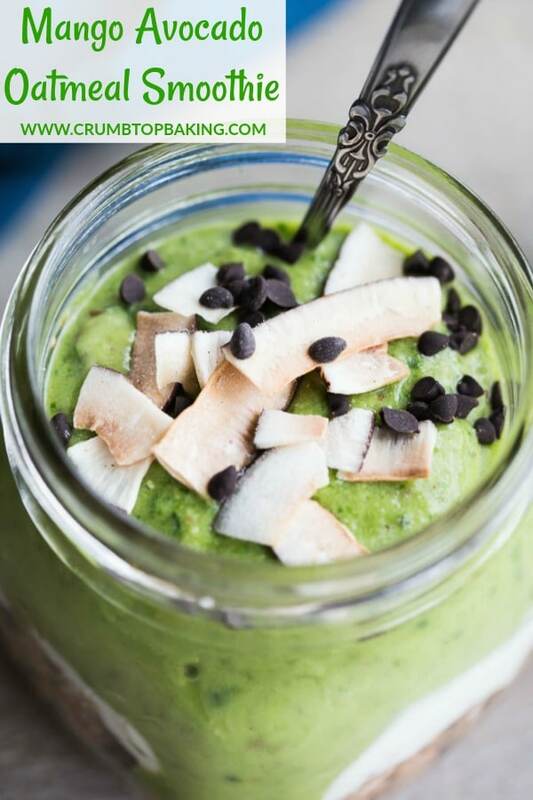 So much yummy stuff going on in this smoothie! And I need to look for frozen avocado, I had no idea it was a thing! Thanks! Thanks Lisa! The frozen avocado is so awesome and it works really well in smoothies! I hope you can find some! Enjoy the rest of your week! OOOOOH this smoothie looks so good Leanne, I love the combination of ingredients. Smoothies are such a great breakfast idea and this one looks amazing. I loved the winter sunshine salad so much…I prepared it for lunch last week and everybody loved it too,the citrus honey dressing tasted so good. So thank you for the great recipe and really looking forward to trying this one as well. Thank you so much Ashika! I’m so happy you liked the sunshine salad and citrus dressing! The combination of ingredients in this smoothie is pretty filling. Be sure to let me know if you get a chance to make this one! Take care! I can’t even begin to tell you how comforting this smoothie looks. There’s something about avocado that’s so dang satisfying! I’ve made many a smoothie before but I haven’t made one with mango and avocado. Pinning for later! Thanks Christina! 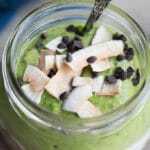 The avocado makes the smoothie extra creamy and the mango adds a little bit of sweetness. Let me know if you give it a try! And enjoy the rest of your day! Thanks Agness! 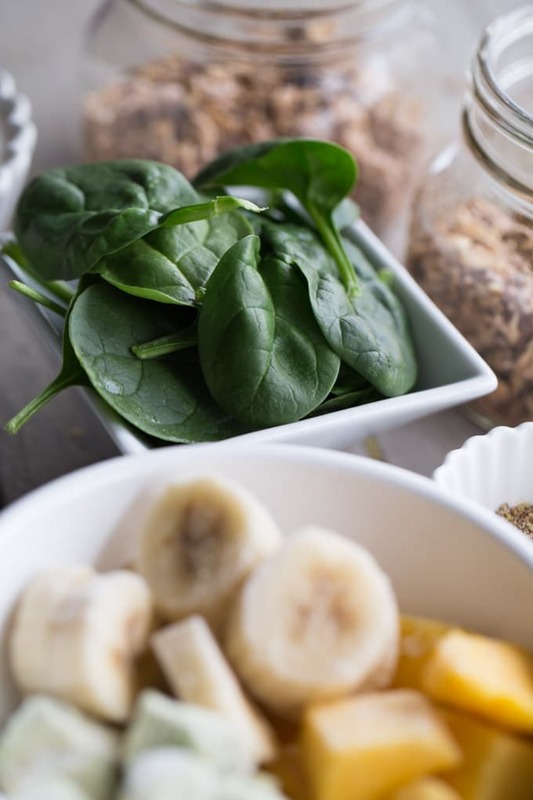 The combo of ingredients really packs a lot into this smoothie! I hope you like it! Enjoy the rest of your week! I’m all about the frozen avocado Dawn! And this smoothie is definitely a great way to change things up. At least it was for me! This is why we’re friends. I fall asleep every night thinking about what I’m going to have for breakfast, and breakfast is really all that gets me out of bed when I wake up :). 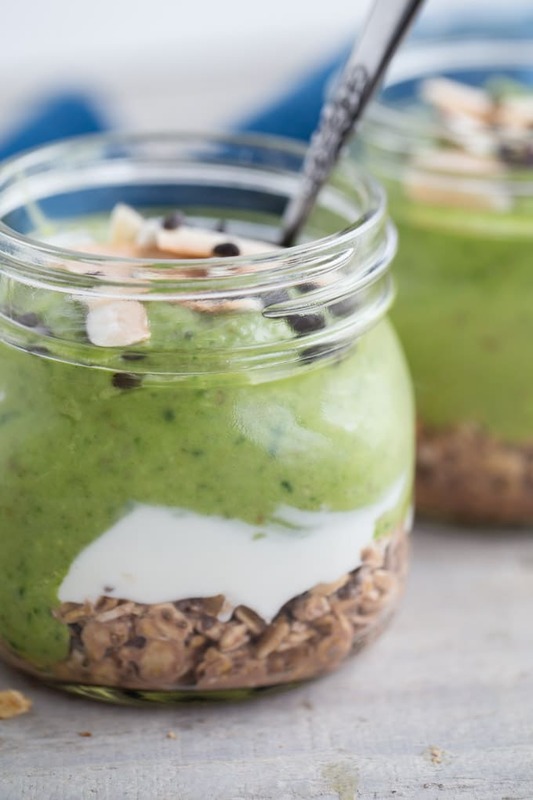 I’m totally trying this because overnight oats and green smoothies are two of my favorite things. This will get me out of bed for sure! Haha! Thanks Kelsie. So glad you can relate!! I hope you get a chance to give this a try. The overnight oats and green smoothie combo is quite filling! Let me know what you think if you do! Happy Wednesday! I totally need some clean eating goodness Leanne! These look yummy! Thanks Mary Ann! 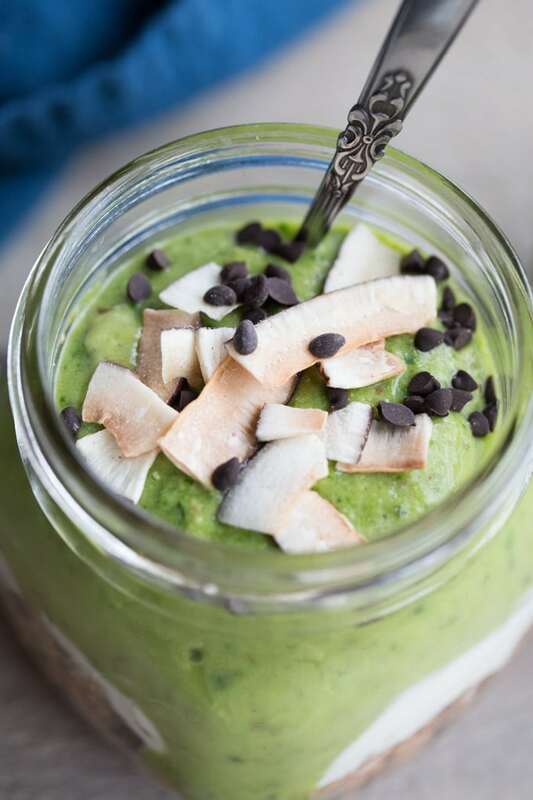 This smoothie has been a go-to, clean eating breakfast since the holidays! Not only do I LOVE the colour of this smoothie, I think it would be just the perfect way to start the day!!! Piling in all that goodness all at once has gotta give your body a super boost! Looks so yum, Leanne! Thanks Katherine! I definitely included a lot of ingredients in this one! But it’s super filling, so perfect for breakfast! I would love to wake up to this! The color…the flavors…. Breakfast Perfection! Thanks Annie! It’s definitely a filling breakfast! I’m the same way…I love smoothies but never thing of them as a meal. They’re more like a snack for me! This smoothie-oatmeal would change all of that because of the oats. This looks so hearty and wholesome and I know it would be a hit with my kids! Thanks Marcie! The oatmeal definitely makes it filling, and it probably eats more like a parfait than a smoothie! Hope you get a chance to try it! I’ve always wanted to try incorporating avocado into my smoothies! I like the avocado in this smoothie as the banana and mango sweeten it up, so you don’t really taste the avocado. Hope you give it a try some time! Happy Sunday Christie!